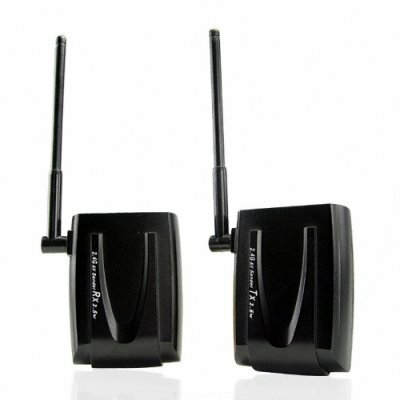 Successfully Added Wireless Audio and Video Transmission Kit to your Shopping Cart. Wired is a thing of the past, no-one wants to be seen dead with a video cable, running across the living room floor or even worse cables running across open ground out to a sleep-out or sub building. This wireless audio and transmission kit will take the hassle (and the cables) out of problematic audio visual installations. With transmission power of 2.5W you'll get a typical range of up to 100 metres indoors (even further outside)- plenty to bridge the gap for the farthest surveillance camera. Why not set up a remote television so you can watch whatevers on in the lounge in the bedroom or use the kit to simply extend the coverage of your camera setup. An extremely handy product and something that you'll always enjoy for it's pure simplicity, buy at our ridicualous wholesale prices and sell on to millions of customers and use our drop shipping service for trouble free trading..